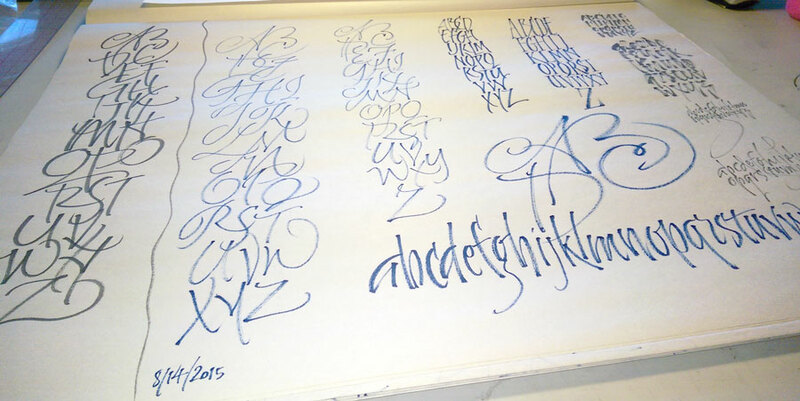 Pentel Color Brush — the one with that in-your-face blue ink — on a scrap of Strathmore Drawing 300. 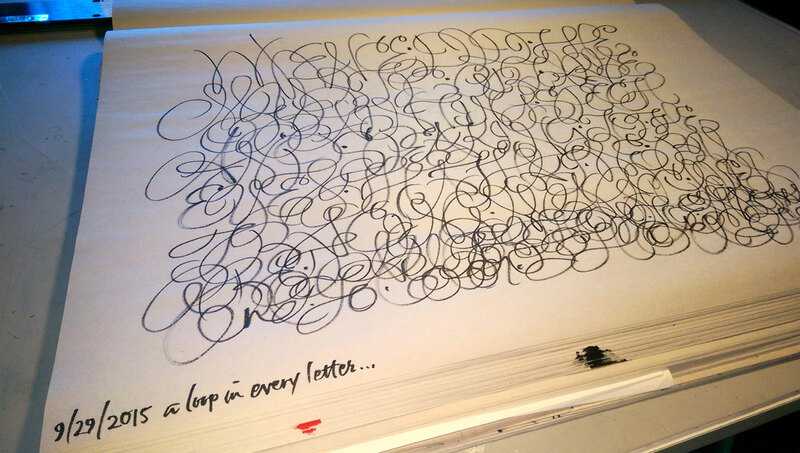 Some days my letters run the gamut from A to … um, A. 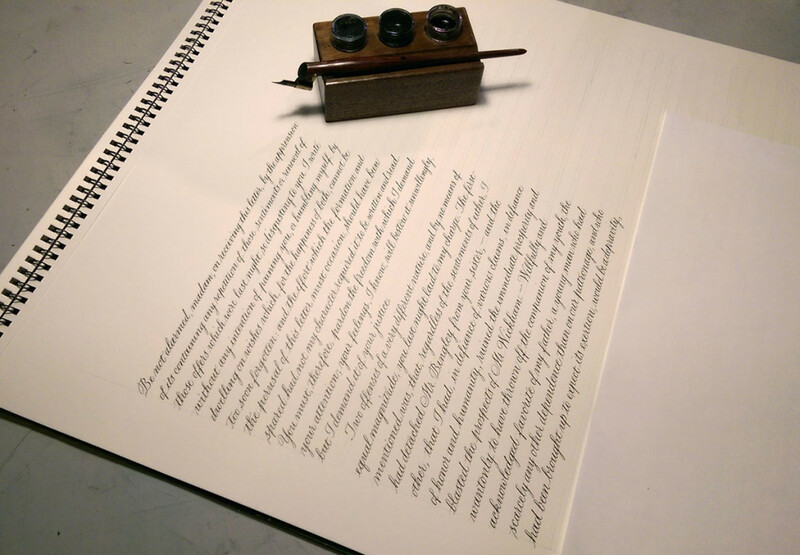 Pointed pen practice: Jane Austen’s letter from Darcy to Elizabeth in Pride and Prejudice. Principality nib at x-height=2.8mm. Moon Palace sumi ink on Strathmore recycling drawing paper. 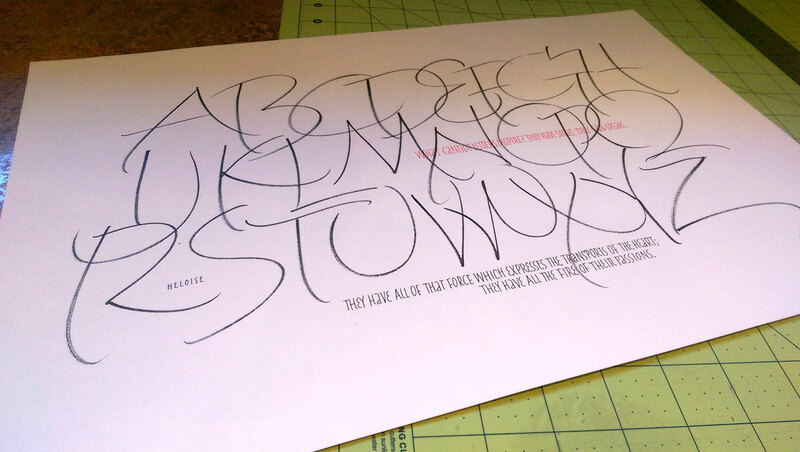 Today’s work included the final lettering for a commission: a long text in pointed pen script. I haven’t done much pointed pen lately, so I did this piece as a warm-up. It’s the beginning of the famous letter from Darcy to Elizabeth in Pride and Prejudice. Fun stuff. Good thing this wasn’t the real commission: there is a hando (rather than a typo) at the end of the very first line. The pen nib was new but awful. I had to change it out before starting on the actual commissioned piece. 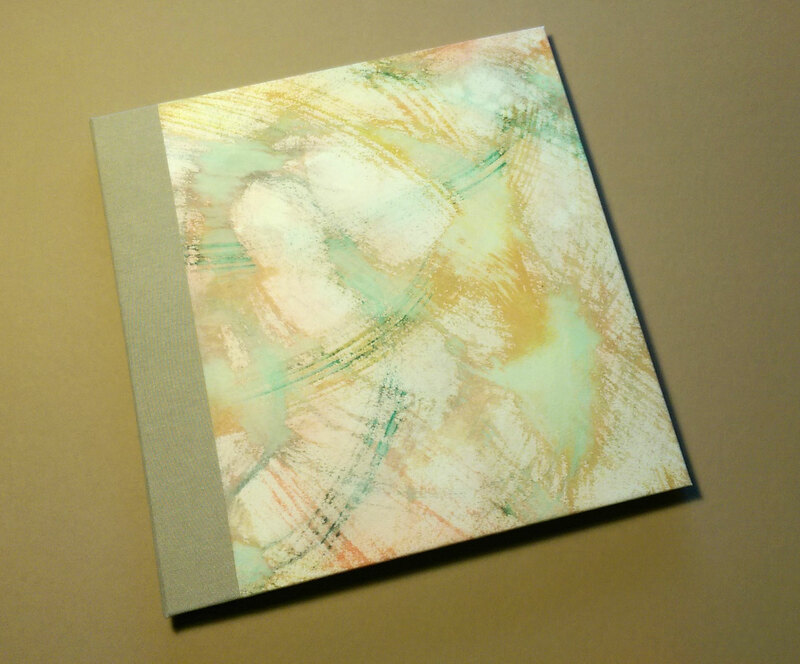 Yesterday I finished the testing binding for our local guild’s collaborative book. It had been awhile since I cased in a book. It’s rather amazing how much I forget between bindings … and also how much I remember of the tiny details. 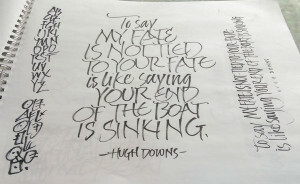 Unfortunately, often the details I remember are the same ones I’ve forgotten until just after that detail is executed. 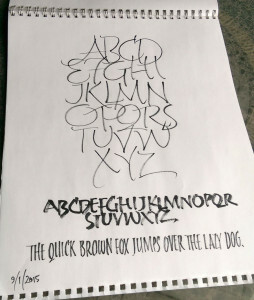 Sakura 3.0 mm calligraphy marker on newsprint. And here is one of this morning’s daily ABCs. 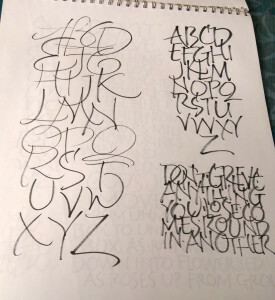 A pretty good page of daily lettering. The small stuff could have benefited from a little Fibonacci planning … if I had been planning. 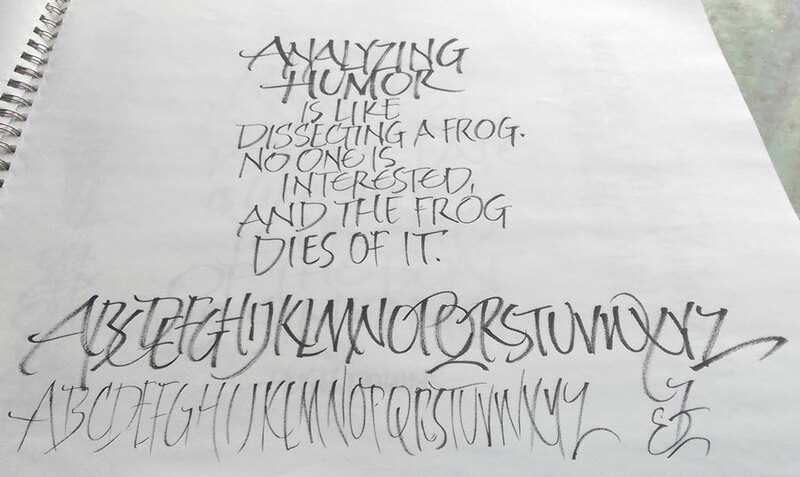 Cocoiro brush pen and Zig roller pens on Strathmore Charcoal paper. 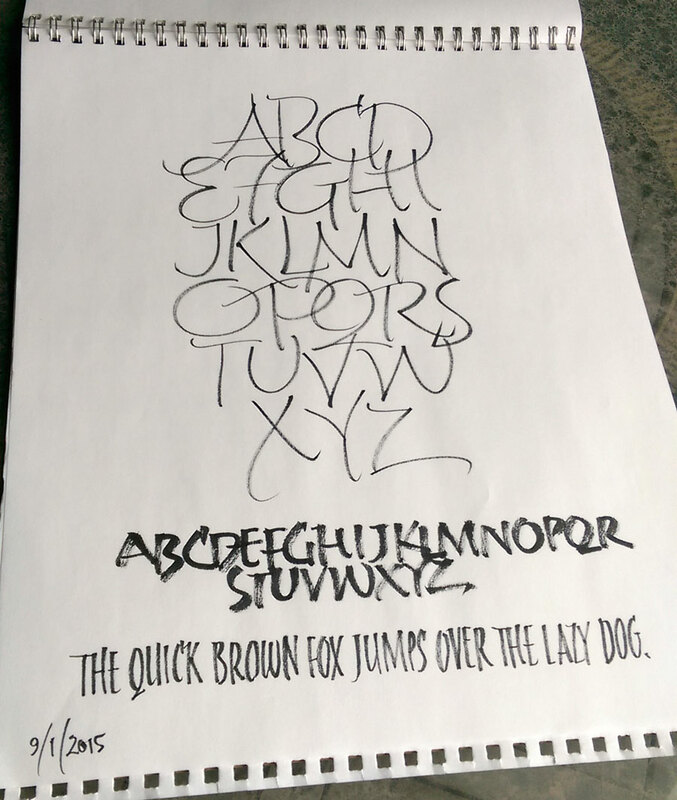 Even though I’ve been on the road for a week, I still found time to do some daily lettering. 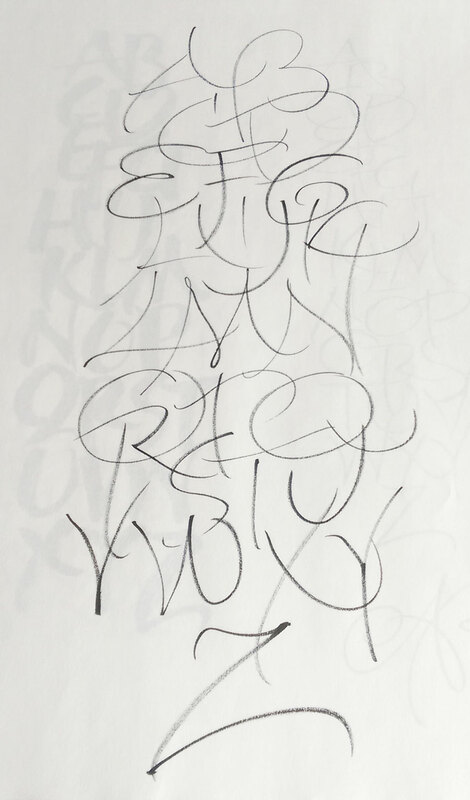 This gestural stuff is simply addicting. 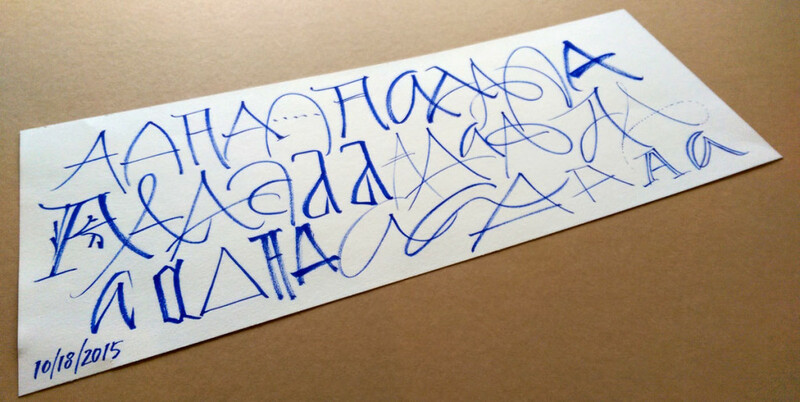 Alphabet as gesture. Pentel Color Brush on Strathmore 300 Drawing pad. And more, but with a block of stacked letters as well. 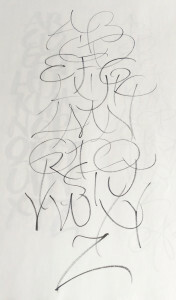 Trying to keep the gesture, even when the syntax of the letters begins to intrude. 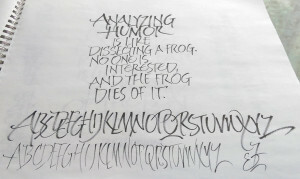 Continuing the ABC gestural exercise, and adding a pangram sentence to the mix. Returning to just the ABC and emphasizing the gesture. Moving to a sentence and trying to keep the gesture. More alphabet, because it’s easy to lose the gesture when the sentence comes into play. 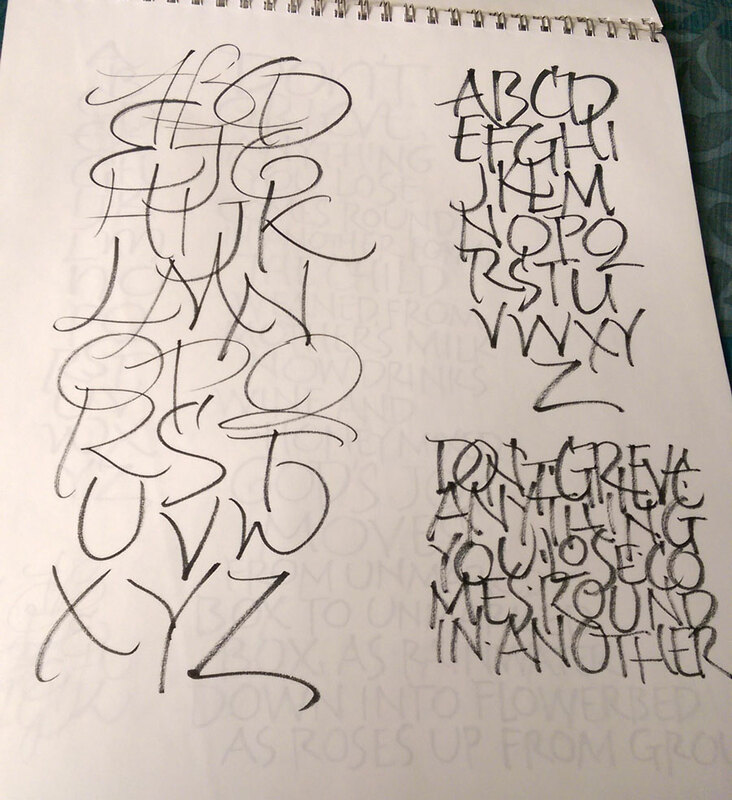 Back to sentences, and then more alphabet. The gesture goes dead so easily. 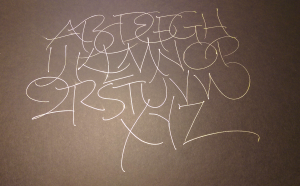 Alphabet on that inexpensive “rice”paper you can get in packets. Drying-up Pentel color brush. 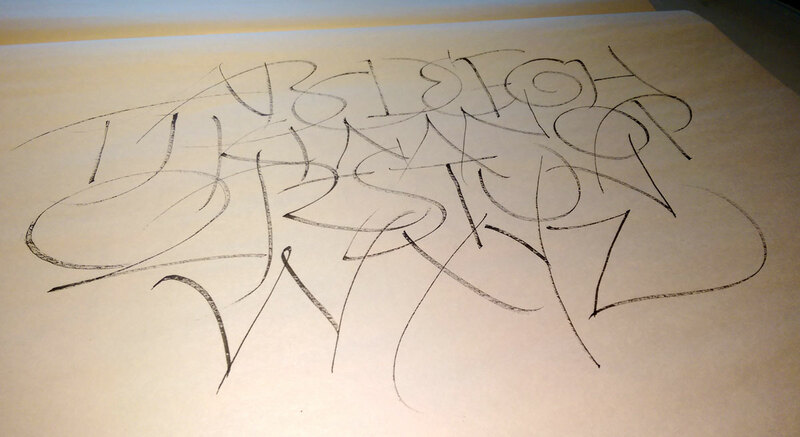 Alphabet on Strathmore charcoal paper — starting from Z and working up. Someone stop me. No, not really. Well, maybe. 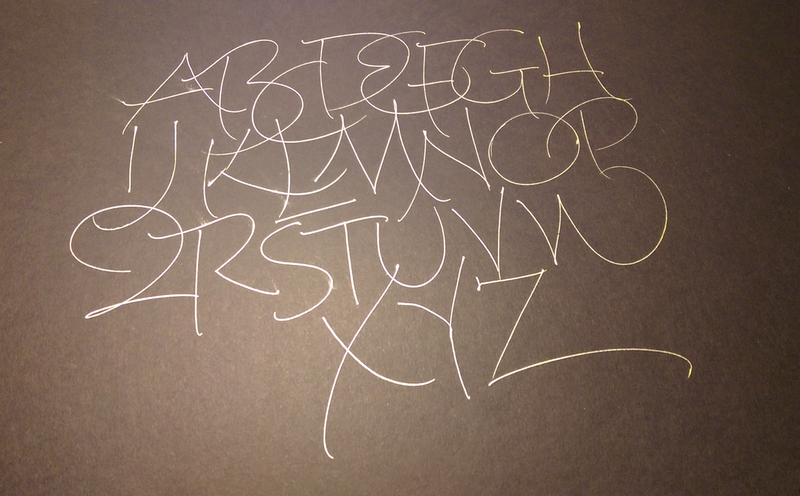 I’ve now done several alphabets in Z-to-A order. The third image is one of those. It is about focus to some extent. I find it easier to be more even* when I work up, and it’s interesting how the questions of space change when I’m going in the opposite direction. *By “even”, I mean that my focus and tempo and looseness tend stay more constant throughout. This third image is a poor example of that, but as a rule, this evenness is more pronounced when I start at the end. As always, click on the images for a closer look. It’s really quite addictive. I’m not sure what I’m going to do with, but it’s absorbing. Pentel Color Brush on newsprint. 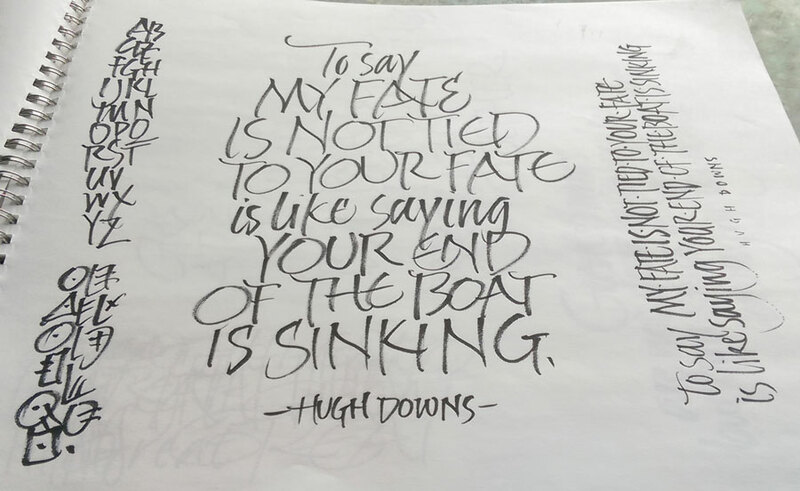 At the annual calligraphy conference held this year in Sonoma County last month, I was honored to attend Ewan Clayton’s four-day workshop entitled “The Spirit of Invention”. 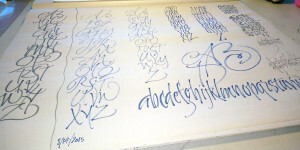 We looked at new directions which several German calligraphers took after World War II. 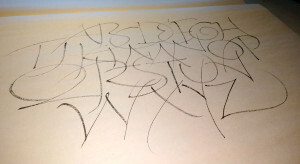 One of these calligraphers, Werner Schneider, explored handwriting and gestural mark-making. 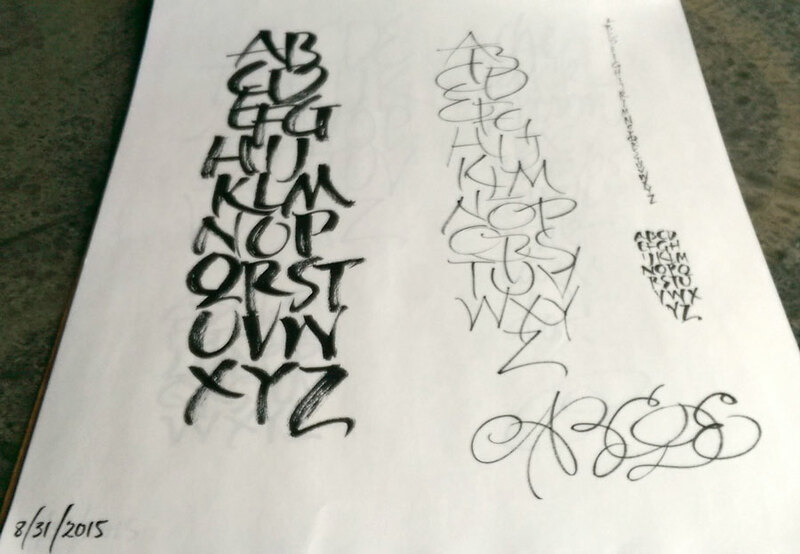 We were introduced to an image of a gesturally made “ABC”, and every morning we began with a page or more of the same, first copying that gesture and then branching out on our own, changing the gesture and/or adding more letters. 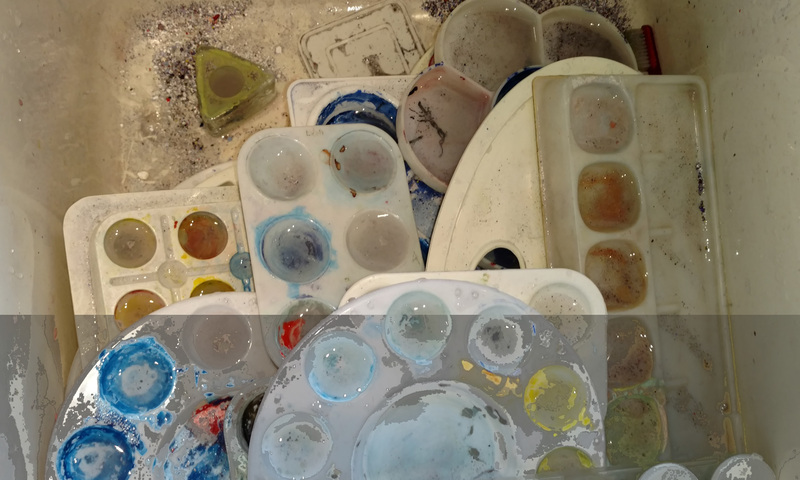 As we repeated the exercise each morning of the workshop, I was interested to see not just kinetic memory development but a change in my own awareness of what I was doing. Here’s one example: I would make the A and the B and then change my position to make the C. I was totally unaware of this until Ewan pointed it out to me. Something I figured out on my own, later: I was losing focus at the end of the C.
Back home, I’ve continued the practice, spurred by the purchase of a 100-sheet roll of packing paper at Home Depot for $4.97. A few days later I realized that I had an 18″ x 24″ pad of newsprint that would serve even better, especially in keeping the pages in order. (I’m working from the back of the pad of paper to the front.) Every once in awhile I’ll switch to better paper. 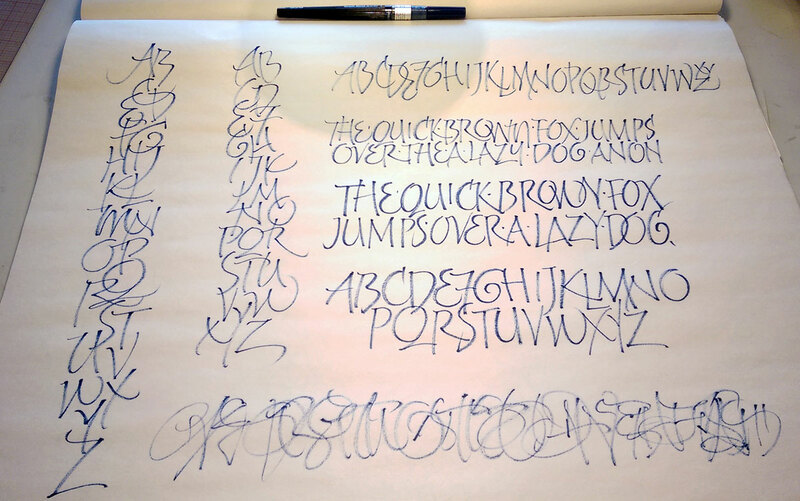 I’ve used a number of tools: the Winsor Newton 7 Series brush that I used for most of the exercises during the workshop, a blue slick-rolling pen that was in our conference goody back, a couple of Pentel Color Brushes. 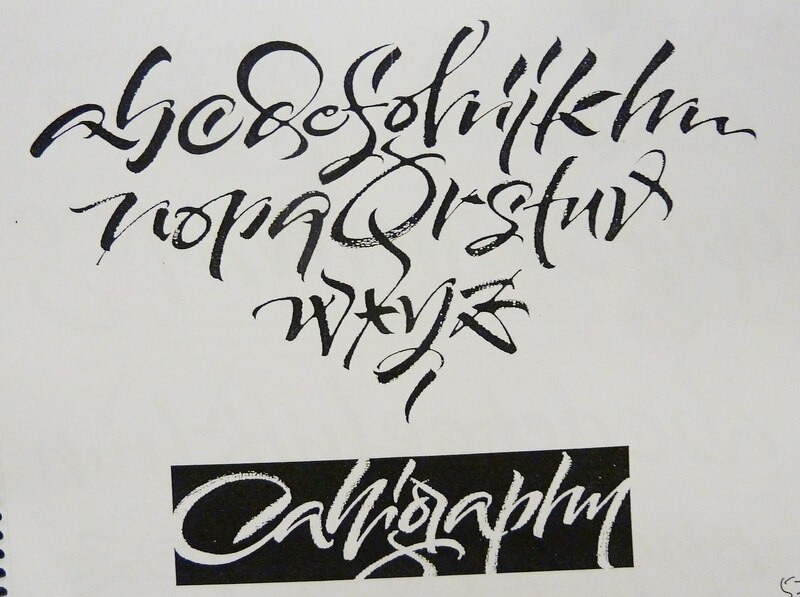 I’m learning a lot, but most of it is difficult to communicate.